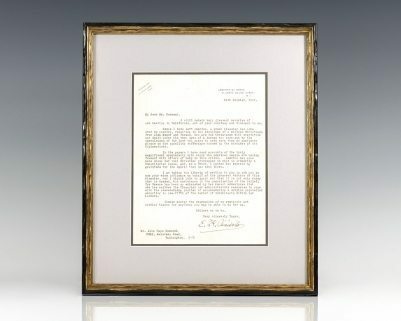 Eleftherios Venizelos Autograph Letter Signed. Autograph letter signed by “the maker of modern Greece,” Eleftherios Venizelos. One page, typescript on Delegation Hellenique letterhead, the letter reads, “Lausanne, 7th December 1922 My dear Mr. Hammond, I thank you most cordially for your letter and wish to express to you the deep gratitude that I feel for the promptness with which you have do kindly undertaken to help us in this hour of trial and misfortune. I am indeed very sorry to hear that your daughter has been ill and hope that she has by this time completely recovered. My wife joins me in cordial greetings to Mrs. Hammond and yourself. 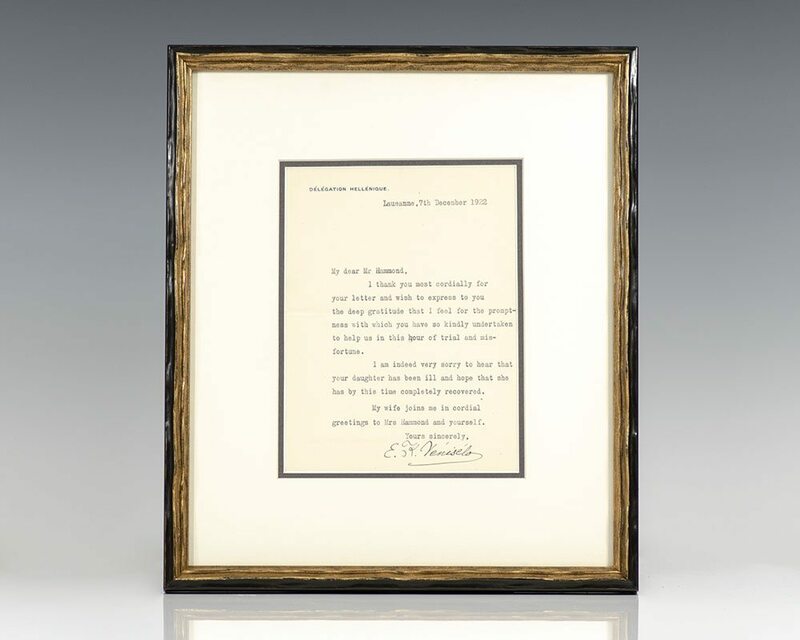 Yours sincerely, E. K. Veniselos.” The recipient, John Hays Hammond was a successful American mining engineer, diplomat, and philanthropist with who Venizelos corresponded regularly. A close friend of President William Howard Taft, Hays was appointed a special United States Ambassador and became chairman of the U.S. Coal Commission in 1922. In fine condition. Double matted and framed, the entire piece measures 12 inches by 14 inches. A nice association. Greek statesman Eleftherios Kyriakou Venizelos was an eminent leader of the Liberal Party and elected a total of eight times as Prime Minister of Greece, serving from 1910 to 1920 and from 1928 to 1933. Venizelos had such profound influence on the internal and external affairs of Greece that he is credited with being "the maker of modern Greece." In World War I, Venizelos brought Greece on the side of the Allies, which expanded the Greek borders but also brought him into conflict with the Greek monarchy, causing the National Schism. Despite his achievements, he was defeated in the 1920 General Election, which contributed to the eventual Greek defeat in the Greco-Turkish War (1919–22). In his subsequent periods in office Venizelos succeeded in restoring normal relations with Greece's neighbors and expanded his constitutional and economical reforms. One folding page letter hand-written and signed by “the father of modern Greece,” Eleftherios Venizelos. 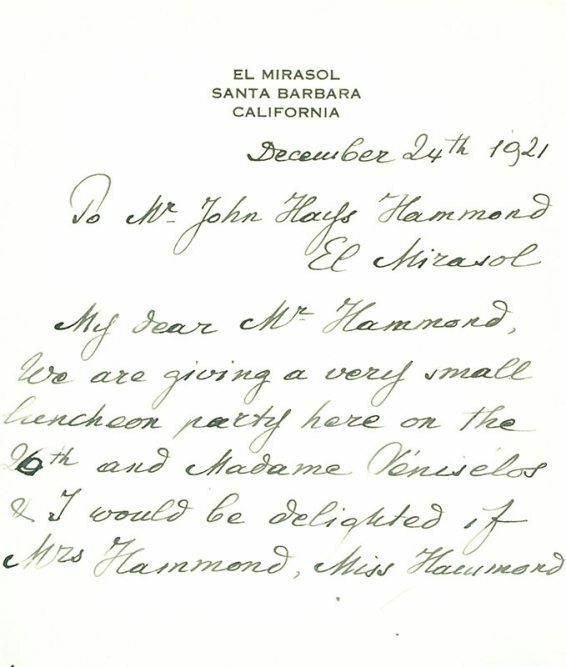 Dated December 24th, 1921 on letterhead from the El Mirasol in Santa Barbara, California, the letter reads “To Mr. John Hays Hammond El Mirasol. My dear Mr. Hammond, We are giving a very small luncheon party here on the 26th and Madame Venizelos & I would be delighted if Mrs. Hammond, Miss Hammond and yourself would give us the great pleasure of your company at 4 p.m. on the day. Very Sincerely yours, E.K. Venizelos.” The recipient, John Hays Hammond was a successful American mining engineer, diplomat, and philanthropist. A close friend of President William Howard Taft, Hays was appointed a special United States Ambassador and became chairman of the U.S. Coal Commission in 1922. A nice association. Autograph letter signed by “the maker of modern Greece,” Eleftherios Venizelos. One page, typescript on letterhead from Legation de Greece 51 Upper Brook Street. W.1, dated 24th October, 1922 and addressed to Mr. John Hays Hammond 2301 Kalorama Road Washington D.c., the letter reads, “My dear Mr. Hammond, I still retain very pleasant memories of out meeting in California, and of your courtesy and kindness to us. 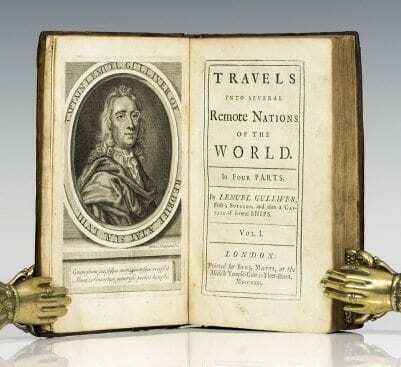 Since I have left America, a great disaster has come over my country, resulting in the expulsion of a million Christians from Asia Minor and Thrace, who are now threatened with starvation and death under the very eyes of a Europe too worn-out by the convulsions of the last ten years to cast more than an apathetic glance on the appalling sufferings caused by the mistakes of its diplomatists. In the papers I have read accounts of the truly magnificent spontaneity with which the American people are coming forward with offers of help in their crisis. America has once more shown her real Christian principles in what is primarily a humanitarian cause, and, as a Greek, I cannot but express my gratitude for the spirit that has been shown. I am taking the liberty of writing to you to ask you to use your wide influence on behalf of the innocent victims of this disaster, and should I like to point out that it is not only money that is needed, but assistance in the organisation of the relief; for Greece has been so exhausted by her recent adventures that she has neither the financial nor administrative resources to cope with the overwhelming problem of accommodating a surplus population amounting to one-fifth of the number of inhabitants within her borders. Please accept the expression of my gratitude and cordial thanks for anything you may be able to do for us. Believe me to be, Very sincerely Yours, E. K. Venizelos.” The recipient, John Hays Hammond was a successful American mining engineer, diplomat, and philanthropist. A close friend of President William Howard Taft, Hays was appointed a special United States Ambassador and became chairman of the U.S. Coal Commission in 1922. A nice association.